After the slate rock is mined from the quarry deposits, the slate rock will be transported to processing facility. Most of them are cut, shaped for being used as roofing and flooring tile, and the scrap stone will be transported to crushing facility for crushing. Slate crusher is widely used for crushing the scrap slate rock for pave and construction application. 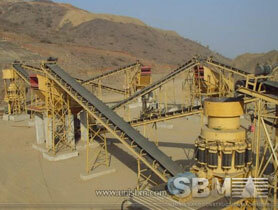 SBM Machinery will supply proved heavy duty crushing equipment to crush the hard, abrasive slate stone. The vibrating screen is also widely used in the slate extraction for sieving. In the slate stone quarrying and processing plant, compact jaw crusher, cone crusher, impact crusher, vertical shaft impact crusher equip with diesel engine is widely used for stone crushing. The compact crushing equipment can save the foot space, enable operation in constrained environments, they also can produce products in consistently size. In the slate processing plant, After extraction, the heavy slate slabs are cut across the grain into set sizes which are a little larger than the finished face size, using a saw that dates back to 1929, when electricity first came to the mine. The material is so hard, that a blade lasts only 200 hours of cutting. "Slate processing plant consists of slate crushing machine and slate screening plant. SBM Machinery always supplies the most valuable machine for the clients." Supply expertise to maintain, improve and operate your plant more efficiently.